2013 Jaguar XE: Biggest. Cat's Eyes. Ever. Automobile's speculatively rendered an all-new model Jaguar plans for the 2013 model year. It's a compact sports-car — a spiritual successor to the E-type called the Jaguar XE and it's taken front-fascia-personification to a whole new level — catsonification. With big cat's eyes for headlights, the exterior's certainly uniquely Jaguar. Which makes sense to differentiate it with the XK, which we're told will share the same platform to keep costs down. You'll also have to check out the rear shot at the link below to show what Automobile's master-shoppers have done to the tailpipes. The powerplant of choice is a new V-6, which may eventually also be offered in high-performance 3.5-liter guise rated at about 450 hp. Although Jaguar currently lacks a dual-clutch transmission, such a gearbox could be sourced from a supplier to complement the regular six-speed manual. 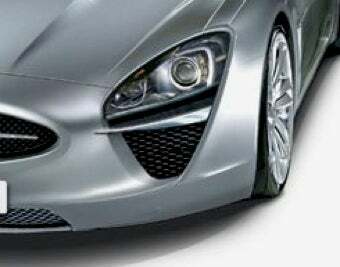 Tentatively labeled XE, the new sports car also would be offered as a more spacious two-plus-two coupe and a hard-core R version, all coming within twenty-four months of the initial launch in 2013.